I’m still not ready to do my Weetcon trip report, but here’s a scarf I made for the raffle. 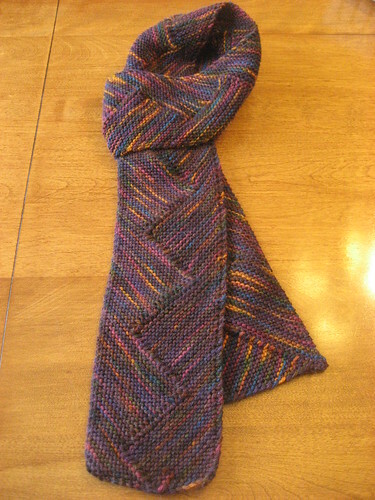 Like the scarflet I also donated, this one is from an Iris Schreier pattern I’d made before. It’s called Zig Zag Scarf, for obvious reasons. I used my entry about my first go ’round with this pattern to help me through the confusing spots. This time, I used the decreases as written, and I think it looks fine. 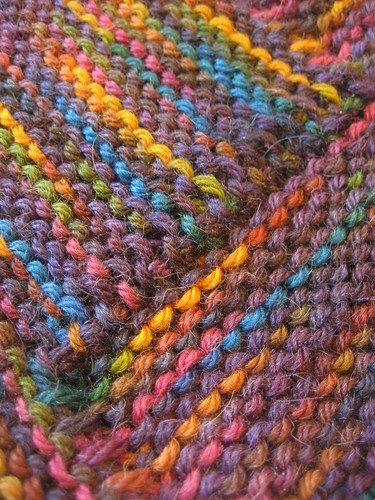 The yarn is from Mountain Colors; it’s their Alpaca Blend (50% wool, 50% alpaca) in the Eureka colorway, which I think has been discontinued. Much like the scarflet, I wanted to keep this for myself because I really like the colors, but I didn’t give in to that selfish part of me, so this scarf now lives with my new friend Jorie, who won it at the raffle Friday night. It was gorgeous (well, probably still is but it’s far away in Jorie-land)!